I'm not a big fan of baseball. I grew up in Alabama. Baseball just isn't very popular around these parts. I've tried watching games, but I don't really feel that deep and immediate connection. Sure, I can watch it, but much like hockey I don't really keep up with it that much. There's Alabama football (and in the SEC in general, too), NASCAR (although not as much these days), and the NFL (I typically follow the Manning brothers since they were SEC QB's) and that's pretty much it for me. I respect baseball and its history, though. Of course, sports anime is another matter. I recall watching a sports-related anime about tennis (a long time ago and you can guess which one) and thinking it was amazing but it is still my opinion that tennis is one of the most boring sports in existence. There are a lot of sports anime out there, too. Track, basketball, soccer, American football, swimming, rugby, baseball, volleyball, cycling, figure skating, racing, boxing, and wrestling have all found themselves being anime material. I'm sure there are a few others, too. Baseball alone has a few anime tributes. One of them happens to be the more recent Ace of Diamond. I generally don't watch a lot of sports anime because I prefer to stick with sports in real life and leave anime to epic ninja fights and stuff like that. However, I decided to watch Ace of Diamond back in July after I finished up No Game, No Life because I wanted something a bit different from the usual fair. I just finished up episode 50 believing that the ending would be soon, but this anime will continue on until March of 2015. It might even continue beyond that for all I know, but right now I think I have a solid opinion of this anime and I am ready to share it. 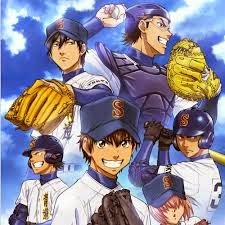 There are a number of terms I learned from this anime like knuckleballs, cut fastballs, and forkballs. So at the very least I can say it is partly educational. I really don't know a lot about baseball, though. I know how many outs there are in an inning, but once I start looking at stats and stuff my head starts hurting. I'm sure it's easy enough to learn, but I'm just that unfamiliar baseball. I can say that this anime is fairly entertaining as long as you don't ask too much of it. It's neither too deep nor too superficial. There's just the right amount of humor and drama. There's plenty of character growth, too. However, this anime will probably be appreciated more by fans of action anime then anyone looking for a romantic angle or a real-life scenario. I'm pretty sure Super Saiyan-like auras do not surround players who are determined to hit a difficult pitch. 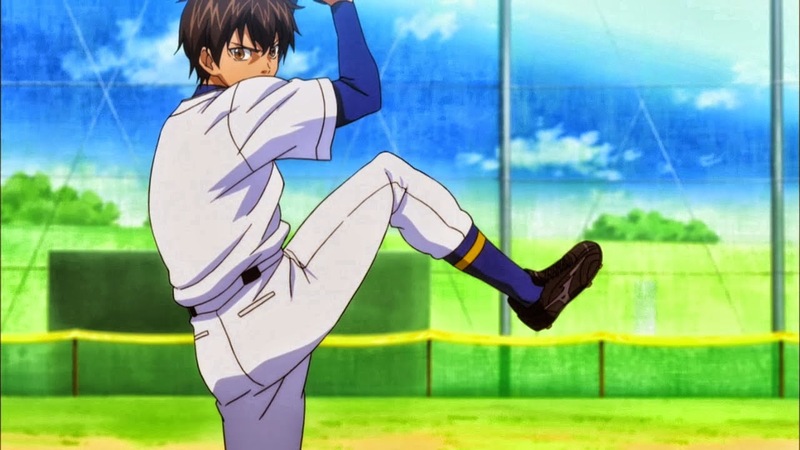 The primary character of this anime is Sawamura Eijun and he is a left-handed pitcher with dreams of becoming the ace of a team going to the nationals. Despite knowing very little about baseball and without having a lot of proper training, Eijun has managed to carry his losing middle school team on his back thanks to his enthusiasm. His talents do not go unnoticed by one of the scouts from Seido High School, either. Although he initially didn't want to go to that school since it would cause him to abandon his current teammates, he is forced to make the decision that is best for his future. 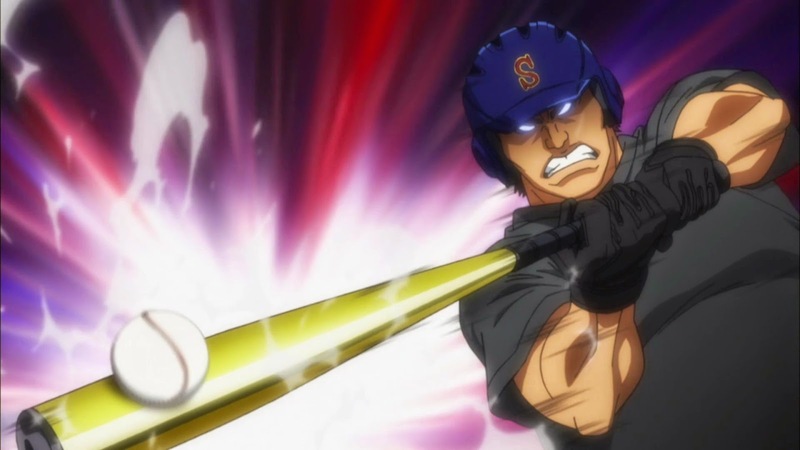 Seido High School might just be his one shot at the nationals, but its going to take a lot of hard work to get there. Seido already has an ace pitcher in the form of Tanba Koichiro, a third year who is determined to keep his place as the team's ace. There's also another pitcher-to-be in the form of Furuya Satoru, a first year like Sawamura who won't back down despite his stamina problems. 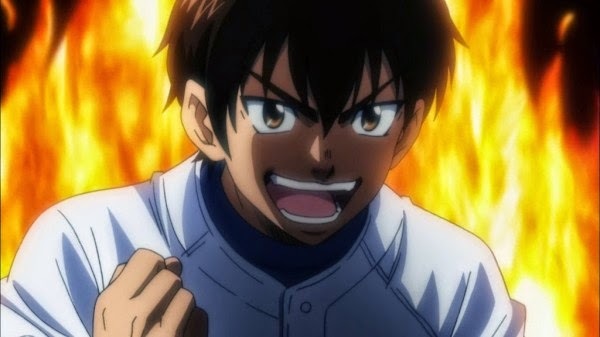 On a team that does not lack good players or potential, Eijun does not have a lot of time to establish himself but he must do so and quickly if he wants to become the ace. There's also the nationals to consider. This is a team that wants to win right now and last year's loss to Inashiro still burns them. Will Eijun be able to make himself useful to a team that wants it all? The baseball games in this anime are typically delivered in multi-episode format and we are given a brief history of all of the perceived enemies. So there's definitely a reason to watch from week to week since there are cliffhangers. Of course, the games that go on for multiple episodes can sometimes seem like they drag on, but compared to the actual game of baseball the episodes of this anime fly by. The only thing that sometimes puts me off is the artwork, but I can't really figure out why. Maybe it's the thick eyebrows and way too big smiles on every character. This anime is still pretty good, though. I'm just not sure how it will resonate with me once I am finished with it. It feels too generic at times to leave a lasting impression, but when it is good it really does seem greater than the sum of its parts.